Every year falling trees cause deaths and property damage. As a result, homeowners get scared of big trees and remove them. Sometimes this is not the best course of action; however, most people want to protect themselves and their property. Check overall tree health- From a place where you can see the entire tree take note: is it leaning? What is it leaning toward? Has it always leaned? Are there any big dead branches? Is the leaf cover thin or are the leaves smalls and have poor color? Are there sections with no leaves at all? If the answer is yes to any of these questions, give us a call. 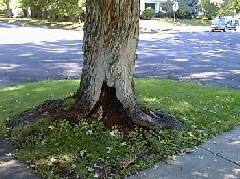 Ground inspection- Trees are held up by roots and also use the root system to draw up nutrients. Anchoring and structural roots are the most visible. Is there rot or decay in the area? Are there mushrooms or fungal growth present? Has the root zone been damaged by construction, grading, or storing heavy machinery under the tree? A tree may appear healthy and vibrant, but the structural roots may not be strong enough to keep it standing. If there are serious root problems, the tree could be dangerous. Trunk inspection- The trunk is what holds up the tree. Look for weakness, disease, cracks or cavities. Is there fungus growing on the trunk? This may indicate a dead section of the wood. Is the bark peeling or falling off? Also look for insect attacks, like Pine Beetles. This looks like pop corn stuck in the bark. An arborist may be able to treat an insect infestation or disease before it become serious, call an ISA Certified Arborist for a proper diagnosis. Canopy inspection- One of the most common and obvious dangers are dead branches and wood. You can spot them easily, dead wood has no leaves or needles. If it has died recently it will have brown leaves or brown needles. Also look for broken branches, especially after storms. To protect yourself, your home, and the health of your tree have weak, cracked, dead, or broken branches pruned and removed from the tree. To get the best care for your trees hire a Certified Arborist. They have the knowledge and training to do the job correctly and do thorough inspections. An Arborist will also always do their best to protect and preserve your trees. Some companies will try to prey on homeowners lack of knowledge and use scare tactics to sell tree removal jobs. Be proactive and inspect your trees and always hire a professional ISA Certified Arborist to properly evaluate the health of your trees.